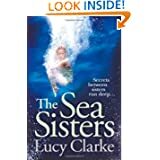 BleachHouseLibrary.ie: Lucy Clarke " The Sea Sisters "
What a wonderful book ! This was given to me my a member of my amazing buddies at Esquires Book Club. So far, this is my favourite read of the summer. It is the tale of two sisters, complete opposites, who decide to live together after their Mum passes away. When Mia ( the wilder, more bohemian sister) comes to a tragic end while in Bali, her sister Kate plucks up the courage to board a plane and face other demons in order to make some sense of Mia's death. She uses her sisters travel journal to discover which areas Mia had been to, and why. It is like taking a look into someones mind and getting a glimpse of what they see. I was sucked in from the very first page and could not put it down! This book has such beautiful descriptive writing and you almost feel like you are part of the story.